"Capturing the exact details of a plant or insect by printing directly from the natural object has been a goal of printers for hundreds of years. 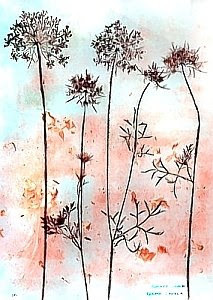 Eighteenth century attempts to print directly from dried plants failed because the material was too fragile to withstand the printing process. In the nineteenth century, printers realized that they could first impress the object into another, harder material which could then be used to make the printing surface. Wood, softened by steam, and various types of metal were used to make a mold from the plants. A successful process was developed in 1853 by Alois Auer, Director of the Government Printing Office of Vienna, and brought to England by Henry Bradbury. Termed "nature printing," the process involved passing the object to be reproduced between a steel plate and a lead plate, through two rollers closely screwed together. The high pressure imbeds the object--for example a leaf--into the lead plate. When colored ink is applied to this stamped lead plate, a copy can be produced. Several colors could be applied individually, by hand, to appropriate areas of the plate and all colors printed together from one pull of the press. Very few books were actually printed by this method during the nineteenth century, with Henry Bradbury continuing to be the leading proponent. 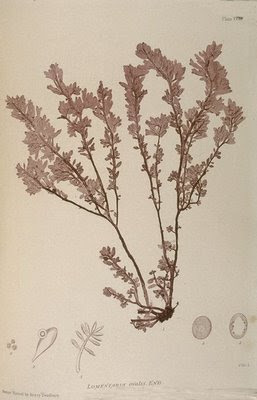 The Ferns of Great Britain and Ireland, published in 1857 and The Nature-printed British Sea-weeds, published 1859-60 are the primary examples of the process. Both books are scientific in approach and include engraved diagrams in addition to the nature printing. The process was ideal for showing the thin two-dimensional fronds of ferns and seaweed, but less successful with more fleshy plants. Bradbury's death in 1860, at the age of twenty-nine, seeded to end major interest in the process. Also referred to as "nature printing" was a different process used specifically for making impressions of butterfly wings. In 1731, The Art of Drawing described a process for sandwiching butterfly wings between two pieces of paper and, by exerting pressure through a press, producing the colored image of the wings. Similar methods were employed at the end of the nineteenth century. The most successful was As Nature Shows Them: Moths and Butterflies of the United States, published in Boston in 1900 by Sherman F. Denton..
Information about contemporary nature printers can be found at the nature printing society, source of the above work by Renata Sawyer. Thanks from me as well, Arkady. Lovely and well-explained information about an elusive but incredibly effective and evocative art form. I have tried and tried posting comments here. I am not sure I am that stupid, but I have wanted to compliment this blog for a long time. I think this is one of the finer blogs I have ever seen and just want you to know the respect I feel for this informative, entertaining and fascinating spot. Oops, looks like I was just stoopid, lol. Another nature print from Auer: here and one by Henry Bradbury here (also another one? by Henry Bradford here -- maybe they mixed the name up with this one?). Is there any record of using clay as a medium to preserve images in lieu of metal? I've been doing some of that with ceramic tiles, although not from a preservation angle, just aesthetics.